The words to describe this escape me. "Goofy looking" seems to work for me. And when did Iver Johnson start making guns again ? I thought they went out of business years ago. Stupid. That's what I wanted to say. 12_Gauge_Chimp wrote: And when did Iver Johnson start making guns again ? I thought they went out of business years ago. I'm just picturing someone in shorts and a t-shirt emptying the "optional 28 round drum magazine" as fast as they can, then letting that 11" long uncovered barrel touch bare flesh. I actually haven't seen those, but now I'm interested in looking for them. Not that I want one, of course. I just want to see if those are as goofy looking as the carbine they're bringing to the market. It’s no Ciener conversion to go with my pocket 9, but this may just be the ticket for popping those pesky feral dogs in Mogadishu... I mean out at the farm. 2A Arms .22 conversion available for preorder. Channeling my inner Longey/Zantra aside, any thoughts from the hive mind? I’ve never owned or even used one of these kits... I assume this is a reliable setup, but again, no experience whatsoever. I think it’d be kind of cool to throw the entire kit into a single pouch...a lot easier than carrying a second rifle when I just want to plink or pop gophers/snakes out at the ranch. I’m a big 2A arms fan too...they make good stuff and have always done right by me re: customer service and accomodating special requests/special orders. 91Eunozs wrote: It’s no Ciener conversion to go with my pocket 9, but this may just be the ticket for popping those pesky feral dogs in Mogadishu... I mean out at the farm. Seems like whichever brand you look at, there will be equal numbers who swear by them....and swear at them. I have a CMMG conversion kit with BHO device. Works as advertised....Although, right around 500 rounds, the tip of the firing pin broke. I replaced it with a Taccom enhanced FP, and it's been fine since. Does it come with a refreshing bottle of piss to cool off after a hard day's worth of shooting?? JeeperCreeper wrote: Does it come with a refreshing bottle of piss to cool off after a hard day's worth of shooting?? It doesn't even have an on-board storage compartment so users can keep a couple of piss bags handy.....a glaring omission by the designers. That issue will be dealt with when they release the Gen 2 models. My cynicism senses are tingling... He sold tracers? Are tracers illegal? No. Are tracers armor piercing? Not normally. Is armor piercing ammo illegal? Not necessarily, you can't make it. Did he manufacture the ammo? I dunno. Seems like they need someone to point a finger at because the shooter is dead. Perhaps he was manufacturing and selling bullets without a license. You need a license for boolits? The way I read it, it looks like he didn't have as much ammo on hand as dickbag wanted to buy so he put together enough tracers to fill the order. additionally, the author(s) of the article don't know the difference between tracers and armor piercing. Yes, as far as I know you need a license to produce any kind of ammo for retail sale. Unfortunately for this guy there are few answers and the public appetite for slow cooked scape goat is quite strong right now. "Both the XM17 and XM18 pistols experienced double-ejections where an unspent ball round was ejected along with a spent round. Due to the increased frequency of occurrence during Product Verification Test (PVT), the Army stood up a root cause analysis team to identify the cause of the double ejections in parallel with continued PVT. As of this report, this analysis is still ongoing." 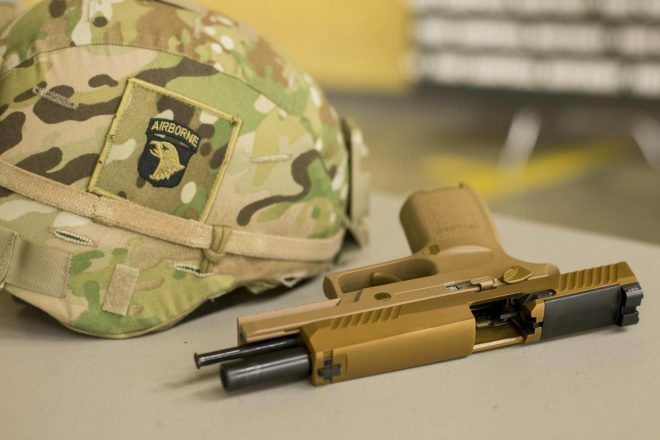 ....While many will no doubt cry ‘should have gone with Glock’ it’s important to remember that the US Military’s previous pistol, the Beretta M9, also suffered serious teething troubles when it was first adopted. Early M9’s suffered from a number of catastrophic slide failures, caused by metal fatigue, which led to injured personnel. The issues with the Modular Handgun System will no doubt be addressed in time and it is unlikely that the issues identified in the DOT&E report will slow the pistol’s roll out as it has already been issued to a number of active units. I was in a discussion about the new Army SIG on another forum and it seems the reporting on the report is highly exaggerated. Ok. We have a thread which got on the topic of animal defense in a bug out and maybe a PAW. We also have a thread on the Boring Flamethrower. I got to thinking, I bet the best bear/lion/wolf defense is a flamethrower. I don't know that it would do so well against alligators and similar critters. Any thoughts? And while I'm mostly joking, I am a bit serious. woodsghost wrote: Ok. We have a thread which got on the topic of animal defense in a bug out and maybe a PAW. We also have a thread on the Boring Flamethrower. Sounds heavy, and like a really good way to set your AO on fire. Not sure how much "burned to death in a forest/grass fire" is from "mauled to death by a large predator". In my mind animal defense and hunting are 2 very different matters. A successful hunt involved a single shot and kill. A defense situation involves driving off the animal. In some cases you may have kill the animal to be successful. However, you may simply be able convince the critter to go elsewhere. That and you may need a magazine full of hits and that is by no means a successful hunting kill it is a successful defense outcome. Where am I going with this? Simple. IMO most magazine fed centerfire rifles are at least in my opinion are adequate for a defense situation involving all but the largest mammals. They may not be ideal or adequate for hunting but can be useful self defense. Last edited by raptor on Sat Feb 03, 2018 7:52 pm, edited 1 time in total.